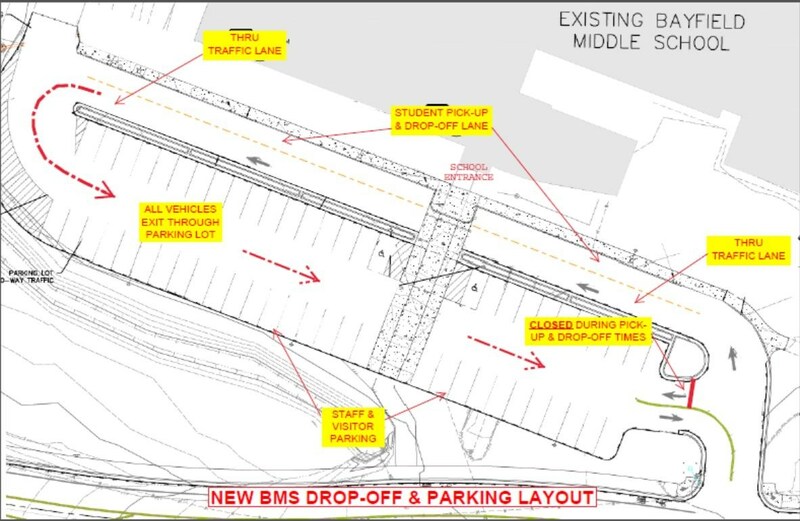 Bayfield Middle School has a new entrance, student loading zone along the front of the building, and visitor parking lot. Please abide by the following safety guidelines for dropping off and picking up students. Drive slowly at all times. Drop-off/Pick-up and parking lot are one-way at start and end of school. Pull all the way forward to the last open spot. Respect others behind you. Loading/unloading at purple curbs only. No drop-off where signed or behind the school. Use the Thru Traffic Lane and merge carefully. Students should always exit the vehicle from the right side. Please plan accordingly. Yield to pedestrians at the raised crosswalk. If traffic is waiting on Oak Street, please avoid left turns when exiting the lot. NOTE: After 4PM, the drop-off / pick-up lane may be used for visitor parking for sporting and school events. Final revisions to Oak Street including sidewalks and crosswalk to the new school will be complete in summer 2018.